Inspired by true events, The Revenant tells an incredible story of survival, of fortitude and of vengeance, with Leonardo DiCaprio playing a frontiersman in the 1800s who must go after the men who left him for dead following a bear mauling. According to the story, these men (presumably led by Hardy) robbed Hugh Glass (DiCaprio) of all of his belongings, and left him wounded. But he survived, and then was driven by an internal fire to find the men, and to pay them back for their "kindness." 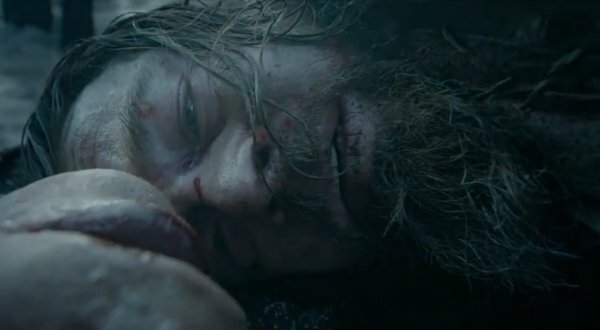 Because this is an Inarritu flick, you can’t NOT marvel at the craftsmanship on display in the first Revenant trailer. As he did with Birdman (and even with Biutiful and Babel), the director challenges himself and his team with long, gorgeous, sustained shots that seem impossible to capture, but plunge you deeper into the story. Look at the horseback shot that concludes this stunning trailer, which shows DiCaprio firing at oncomers as he attempts to flee on a horse. It’s not shaky-cam quality. It’s steady, framed tight on the man’s face, and moving to the rhythm of his panting. You feel as agitated and scared as DiCaprio’s character in that moment. Alejandro Inarritu is coming off an incredible success story with Birdman, winning Director and Screenplay Oscars, and also taking a share of the Best Picture prize. But in no way is he resting on his laurels. He was in the process of shooting The Revenant during the tail end of the Oscar campaign, and he dropped hints at how difficult of a shoot it had been. The director chose to shoot as much of (if not all of) The Revenant using natural light… meaning, if a scene takes place at dawn, they had to wait until dawn to film it. As you can imagine, that led to delays, but they seem to be back on track for an Oscar run this year. The Revenant will open on Christmas Day for awards consideration, then expand to more markets in January.